Financial brands: everyone hates us – do we care? It’s not what you know. It’s who. These five points are basically about why financial brands and both less and more than we usually think they are. 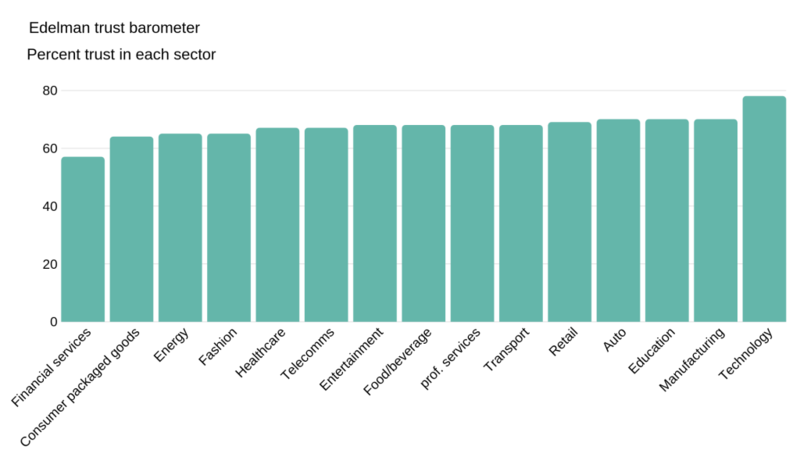 According to the Edelman Trust Barometer (which you can obviously trust, as its run by a PR company) financial services as a sector is recovering slightly from five years ago but is still the least-trusted business sector around the world. And yet we still believe ATMs will give us our money when we need it. And that insurers will pay out when things go wrong. And that investment firms will look after our pensions until we ‘re old. Which means we have to define trust a bit better. All those things we expect finance firms to do for us build transactional trust. What they don’t do is build what’s called relational trust. Here’s a perfect example, even if it’s not a perfect photo. They’re certainly not perfect ads. 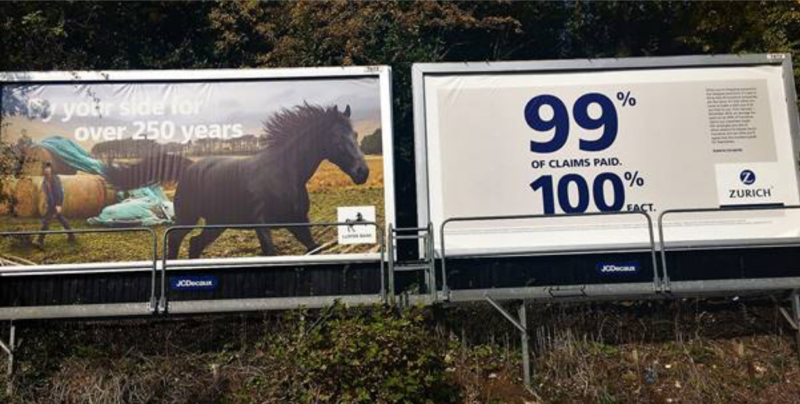 Lloyds have thought carefully about how to rebuild trust in a brand badly damaged in the 2008 crash. You’ve seen the emotive TV ads, the black horse, the ‘by your side’ tagline (which annoyed Noel Edmonds enough for him to sue the bank. Unsuccessfully, if understandably). Zurich take the easier route, offering a purely transactional relationship. Which is fine of course. Until it isn’t. The problem with transactional trust for consumers is that as soon as you let them down (if you’re one of the 1% for example) or someone comes along with a better offer (like 100%) it’s game over. Another highly trustworthy organisation is the Institute of Practitioners in Advertising. Actually they do some useful stuff, like correlating results from over 1000 case studies across lots of sectors to find out what works and what doesn’t. 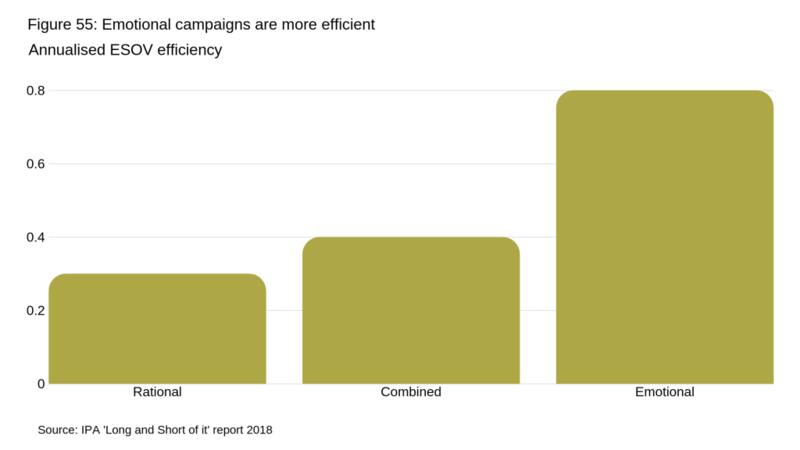 Here’s figure 55 – and it shows that emotive campaigns like Lloyds work more than twice as well as rational campaigns like Zurich. Why? Because our brains are made to make decisions in an instinctive, unconscious way. Helping us make those decisions is what brands are for. Lots of studies have shown that strong brands deliver business results over time. Strong brands suffer less in downturns, recover faster and outperform over time. This one from Brand Z is a good one to look at. So why am I saying brands don’t matter, when Brand Z and many others say they do? Well they matter less to consumers, or at least, not nearly as much as your advertising agency will tell you. I bought a chocolate bar yesterday but I can’t remember if it was a Bounty or an Aero. Brands aren’t a big part of people’s lives when they’re small things . Coke or Pepsi? I don’t care that much. On the other hand there are things I do care about. Like my pension, my home and whether my twin son and daughter will have the same opportunities in life. Which is why smart brands are talking to me not about themselves, but what actually matters to me. State street’s Fearless Girl is not only a great campaign. It’s also a great example of how activism is beating advertising when it comes to winning awards. It’s a bit of a shame State Street didn’t check their own gender diversity record before running it, but my daughter likes it, and I’m not sure she’d care much about State Street if she hadn’t seen it. 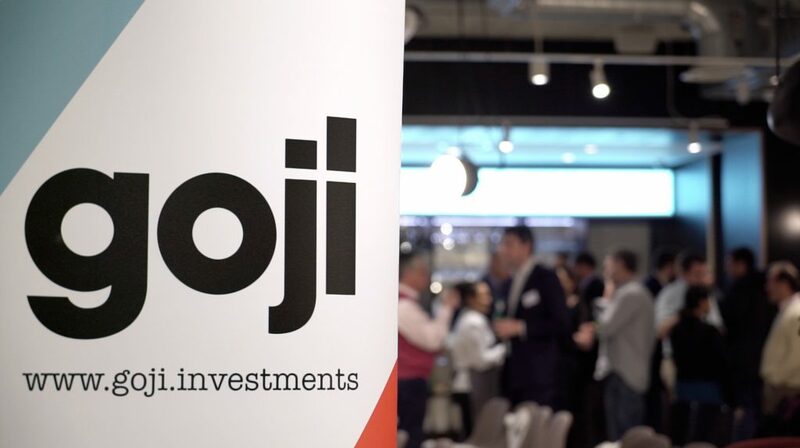 Brands don’t matter to people as much as we think they do, but what finance firms do does make a sometimes enormous difference to people’s lives. So we owe it to them to do the right thing – and to build brands they can trust with their emotions, not just their transactions. People don’t have much time for us, or our brands. They’re far too busy getting on with their lives to pay attention even to a well-made TV ad (and they’ve probably skipped it to get to the next murder in Tin Star). They’re looking at their phones, not at posters or papers. And of course that’s where the smart money goes on advertising. It’s hard to estimate, but researchers think the average consumer is exposed to around 5000 commercial messages a day. If they were actually listening, they’d go mad. So what we all do is stick our digital fingers in our metaphorical ears and go ‘lalalanotlistening’. We only let in messages that are useful, that reflect our own views, or that have unusual impact. 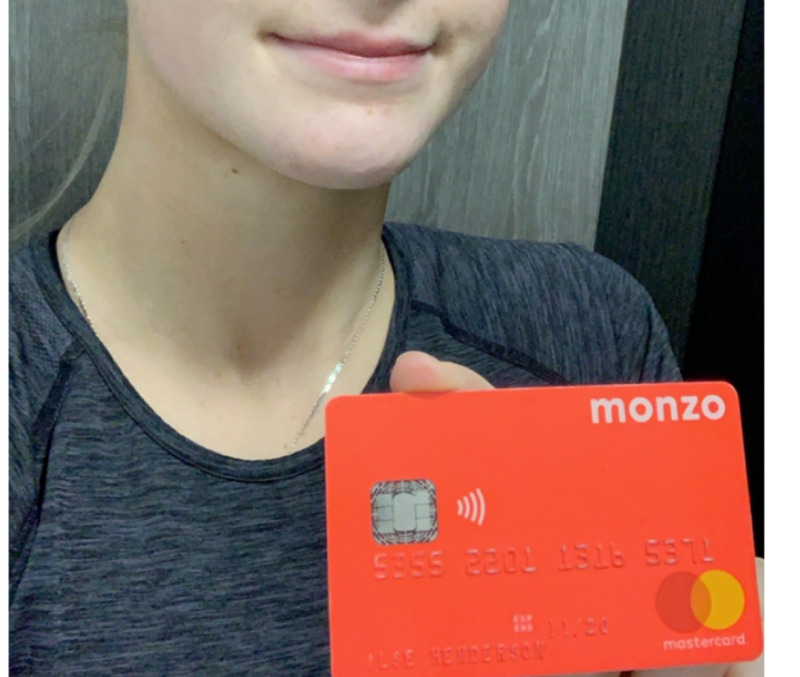 This is my daughter showing off her Monzo card. Monzo says it’s the bank of the future, but actually, it’s just a bank that’s unencumbered by legacy systems and has spent a lot of effort on getting to know people like my daughter. They’ve talked to her about what she wants, then added features that create product virality. She feels she’s helping create the brand. She’s invited her friends to join for added rewards. Monzo just passed a million customers, from a standing start. They’ve done it by being a data-driven bank, that uses data to answer real customer need. Here’s another finance brand using data to give people what they need. Sberbank, in Russia. Know who you’re talking to and you can build exactly the product and service people want, before they even know they want it. Apple, Amazon, Air BnB – they’re not tech, retail, movie or hotel businesses, they are data businesses. But good as they are, Monzo is still just a bank. I’d say we haven’t yet seen the Amazon of banking, or the Google of Investing. 5. We’re not saving the world. This was officially the worst ad of last year. It’s not just superficial, cliched and box-tickingly annoying; it’s also a massive insult to the Black Lives Matter protesters who stood up to police brutality in Baton Rouge and elsewhere which ‘inspired’ this film. Pepsi pulled it after just one day, and apologised to Kendall Jenner (who should have known better anyway) and everyone else. Pepsi had no history of activism, and the insincerity of this ad did massive brand damage. Compare Pepsi with HSBC. Like Lloyds, they’re another megabank trying to build relational trust. I actually like this one a lot more than the Lloyds campaign – it’s about the real world as it is now, not some imaginary, nostalgic past. It has an authentic point of view, based on the bank’s world view. It gently and politely make a point that may alienate some audiences, but will attract others. It’s also a beautifully made film, about how HSBC is trying to do its bit to make the world a better place. That’s what strong, confident brands do. So there you go. Five hopefully interesting provocations about why financial brands are less and more than we usually think they are. We may not care that no-one likes financial brands much right now. But if we keep on trying to do the right thing, maybe one day they will.